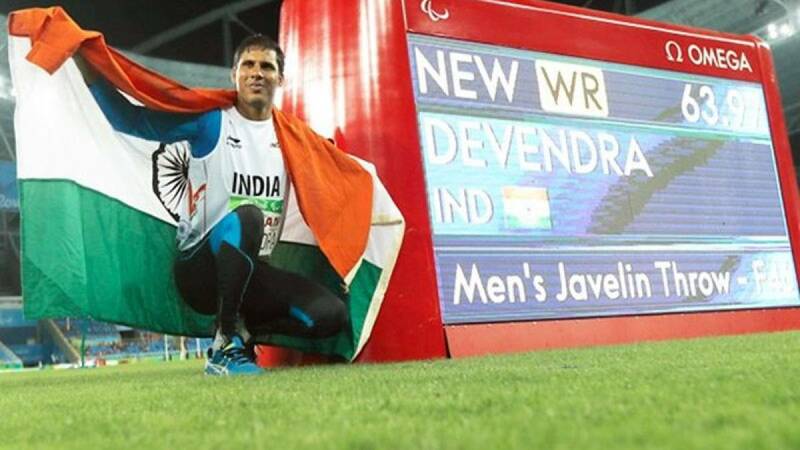 New Delhi : Javelin thrower Devendra Jhajharia bagged gold medal on Wednesday to become first Indian clinching two gold medals at the Paralympics. He broke his own record to clinch the top honour in the ongoing Rio games in Rio de Janerio. # Devendra Jhajharia broke his previous best 62.15 metres (achieved in the 2004 Games) to earn gold medal in Paralympics 2016. # He improved his mark with an attempt of 63.97 metres at the Olympic Stadium (Engenhao). # Another Indian Rinku Hooda, who also competed in the event, finished fifth with a personal best of 54.39 metres in six attempts. # Devendra Jhajharia belongs to Rajasthan. He had lost his left hand at an age of 8. (To know more about him click here). # Currently ranked third in the world, Devendra swelled India's medal tally at Rio to four medals - two golds, one silver and a bronze.